A promo shot of the truly most memorable scene in "The General." Incidentally, stills of this film do not do it justice. 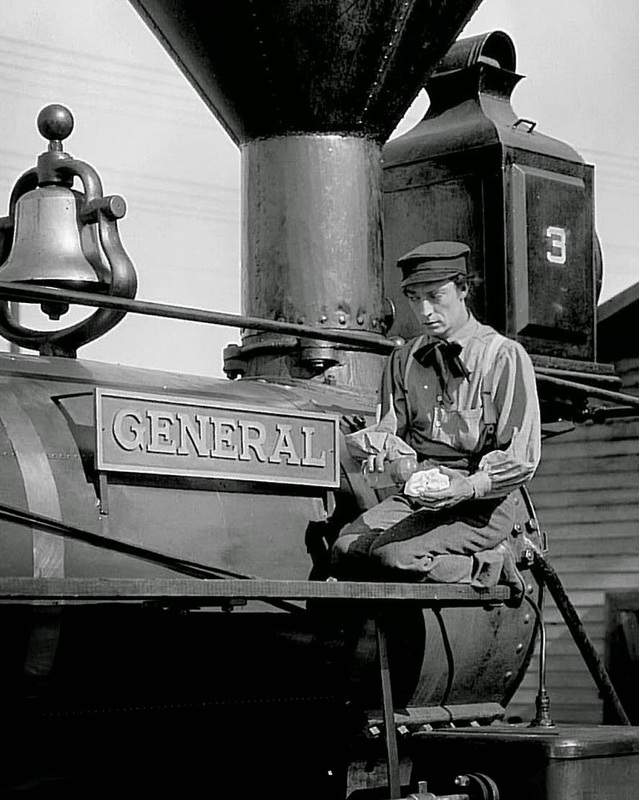 I first saw Buster Keaton in 'The General' in a land long ago and far, far away. I was too young to appreciate it then, but I still remember watching it that hot, steamy July/August night. It was the main feature of a program at the time called, I believe, "Saturday Night at the Bijou." In those days, we only had a black and white television and all watched the same thing together - I know how quaint, but it actually wasn't that long ago (I can just see you thinking I must be 130 years old, but, well, not quite) - so the fact that the film itself was in black and white did not overly detract from the experience. An ice cream truck came by at one point and we all went out to have chocolate milk bars. Having watched it again, I finally understand what I missed all those years ago. There's a slow train coming. The stills completely drain Buster of life and lead to the 'Stone Face' characterization - but his personality comes out through movement, something no still picture can adequately convey. The plot is simple and is part of the epic folklore of American culture. A simple guy is unfairly derided and shunned through no fault of his own. Eventually, though, he gets the chance of redemption - and it involves epic train rides through the heart of American history and the American psyche. You don't get more Americana than "The General." The bit with the mortar looks easy, but took absolutely phenomenal logistics. Anyway, you can read the finer details of the plot elsewhere, along with the background of the film (Keaton was given a book about a real incident during the Civil War and adapted it in his one chance to become a true leading man - which sadly failed because it was not what audiences expected from a slapstick funnyman). Buster is all alone on this one. I'm going to focus instead on some of the real subtle aspects of the film that, judging from reviews of the film that I've seen online, appear to have escaped some viewers. I'm not pretending to be the only one who 'gets it,' but I'm so captivated by some of the sheer brilliance put on the screen in this film that I feel like sharing for anyone interested. The scene that makes the history books. Perfectly captured in, yes, one $42k take. 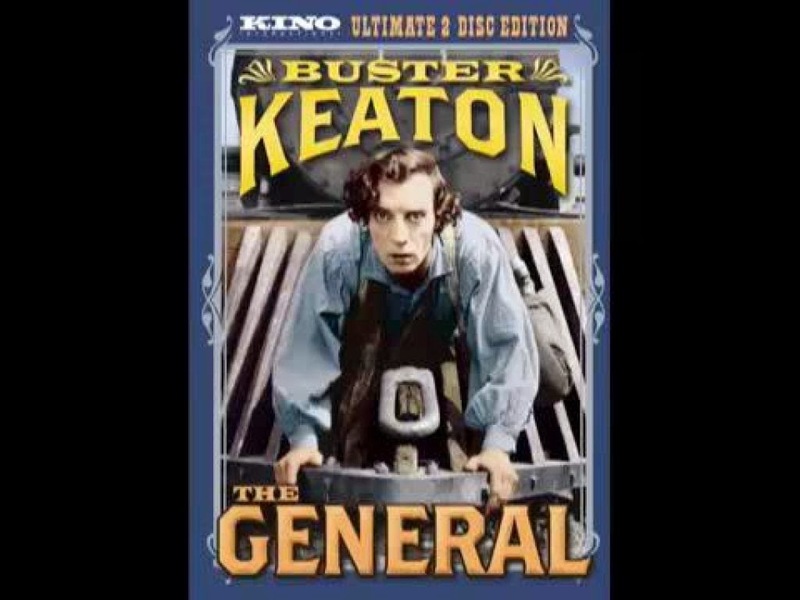 Keaton repeatedly shows that he respects the audience's intelligence. I will point to one scene in particular: for the second time, his train (he's the engineer and sole occupant) is pushing a car (which happens to be flaming due to an attempt to sabotage him). He previously had gotten rid of the car (he thought) by switching it to another track - but the tracks intersected again. So, once again, he jumps out of the train to switch the car to another track - but this time we don't see the whole sequence, just him jumping out of the train toward a switch. That is brilliant editing. 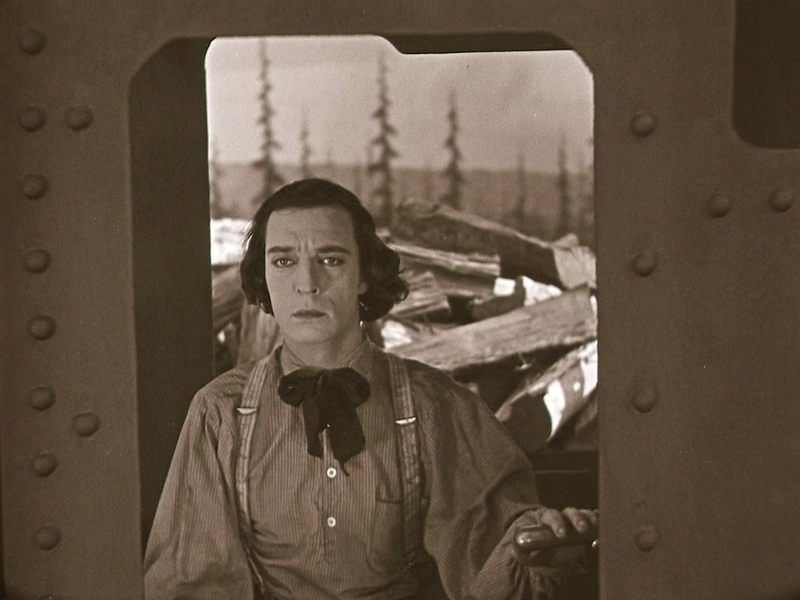 Another time, one of the villains is shown suddenly realizing he is in the wrong disguise on the train (a Confederate uniform) and rapidly tears it off - ha ha, mere mortals! - but the discarded uniform returns later in the film. At the finale, Buster and his girl sit on the connecting rod of the engine again, and we are all set for a variation on an earlier gag - but he suddenly reverts his character to the simply human rather than try to outdo himself again and do what we expect and thereby lose our sense of the unexpected. It is an extremely clever choice that works gloriously, confounding those of us who may think we have him figured out in the very last shot of the film. In general (sorry), the sad sack nature of the Keaton character (named Johnny Grey, you didn't see that one coming, did you?) 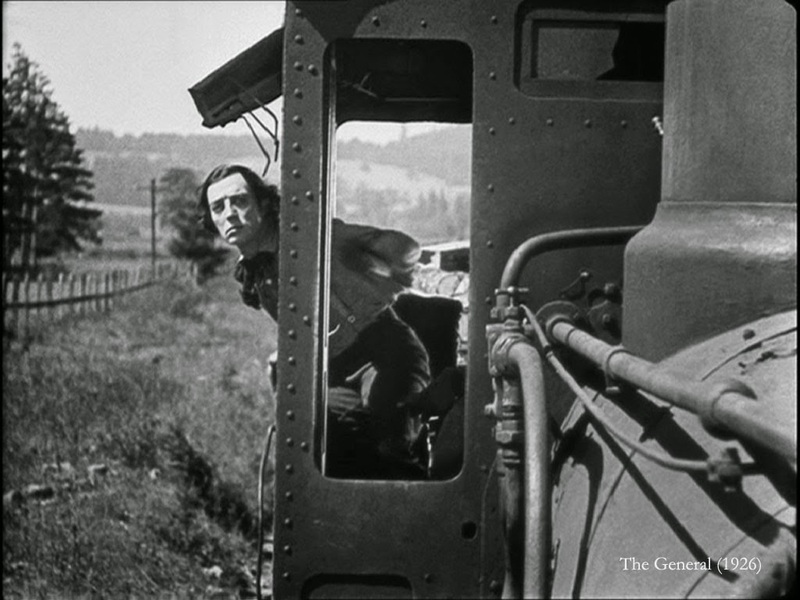 is highlighted because aside from him, the film stays right on the historical straight and narrow, which just draws out Keaton's extremely subtle bits. If you are a Civil War buff, your eyes may bug out when you see that not only does he get the name of the actual General right - he gets the name of the arch-villain correct as well, even though it doesn't matter one iota to the film. Another thing that Keaton does is not try to make his character more heroic than an ordinary guy - though, make no mistake, he performs absolutely extraordinary feats in the course of this film. 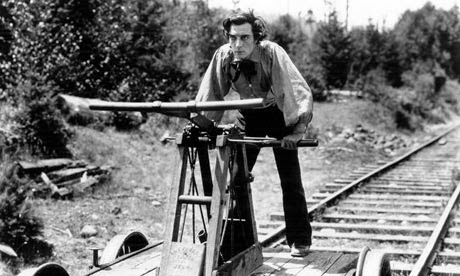 An example of this is when Buster is atop the speeding train, trying to cut some wood for the train's boiler. He is so self-absorbed in his work, so focused - that he doesn't even realize that an entire army (seemingly hundreds of men are shown, driving wagons and marching!) is passing by behind him in the opposite direction. Only when a second army passes by does he suddenly get a clue. He sits back, and gives a 'where did they come from' look, like he was an alien dropped to earth from Alpha Centauri. That is one of the classic scenes of all cinema, much more insightful and memorable than the later train wreck scene that makes all the history books because it cost so much to produce for about ten seconds of film. Another thing that is simply otherworldly about this film is the juxtaposition of the grandest, most grandiose stunts in film history with instances of extreme subtlety and minutiae. There are train wrecks and bears and thunder and lightning - but Buster makes his best points with a single, double, triple, quadruple-take when a train car that his train had been pushing seemingly disappears - for a reason we see but he does not. There are several examples of this, those who call Buster 'Stone Face' perhaps don't get some of the extraordinary subtlety because, well, it's just too subtle in context. But it's there, this is one film that really does bear repeat viewings for that reason. At times, Buster practically breaks the fourth wall, wryly letting us in on the joke - something only the truly great comics can get away with while staying completely in character (such as Stan Laurel). "The General" is the train. Is this a modern pose or what, the man with his water bottle? 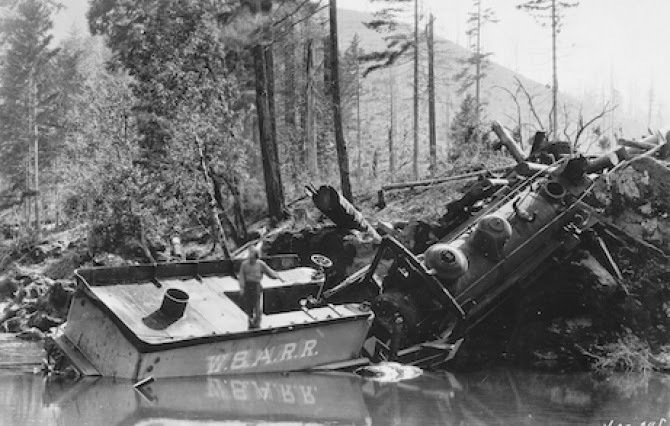 In 1926! The portrayal of the villains is perfect and really makes the film tick. Throughout the film, Buster - alone - is either pursuing or being pursued by a 'hand-picked group of ten men.' They indeed are extremely competent and do everything right - but once again, we get some hilarious but extremely subtle comedy that plays on their very competence. For instance, dastardly fellows that they are, they make all the right moves to evade detection on their train at one point, hiding from view - then all rise in unison, and you can practically hear them chortling in that 'Ha ha, mere mortal, fooled you again!" fashion. You can't actually hear them being pleased with themselves for being so clever - but, really, if you are focusing, you can. Another time, the villains are slowed by a train switch that Buster has bent, and there is a sequence of physical comedy as they gather around it and try to fix it without having a clue that you really have to focus on to appreciate (notice all the big shots confounded by the bent rail, kind of jiggering with it to no effect, until one of the train engineers who actually has a clue comes by and fixes it with a couple of whacks with a hammer). The expression of the Union General after he foolishly sends a train over a burning bridge is priceless right there. These pros are confounded by the poor, self-absorbed sap who just wants his train back, and it is completely believable at every step along the way. Buster just overcomes the overcome-able by overcoming one little thing at a time - and yes, there's a lesson in there somewhere. One more word of praise about Buster's athleticism - Buster engages in stunts that are among the most memorable in film history. 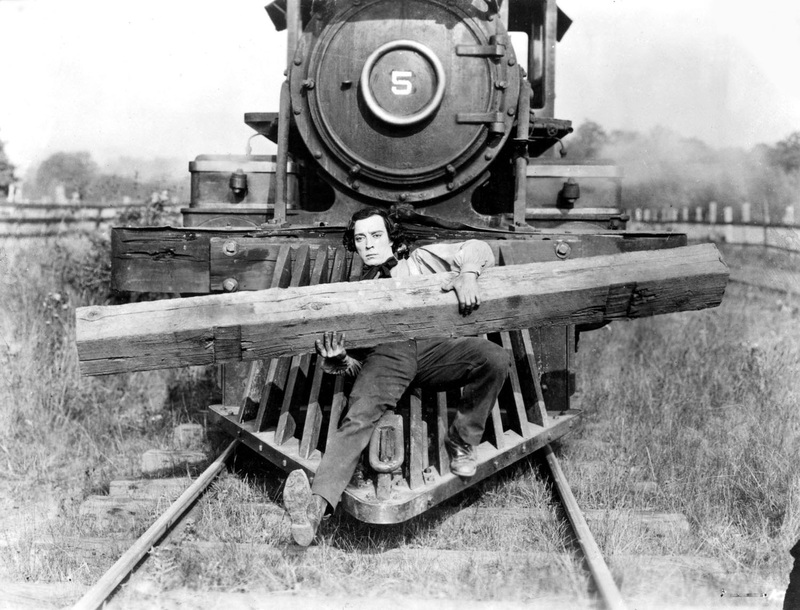 He performs a stunt with large railroad ties - they are heavy! - whilst on the cowcatcher of a moving train that must be watched several times to appreciate. Even then, it is an extraordinary stunt, and just one of many of similar brilliance throughout the film that no stuntman today would touch. 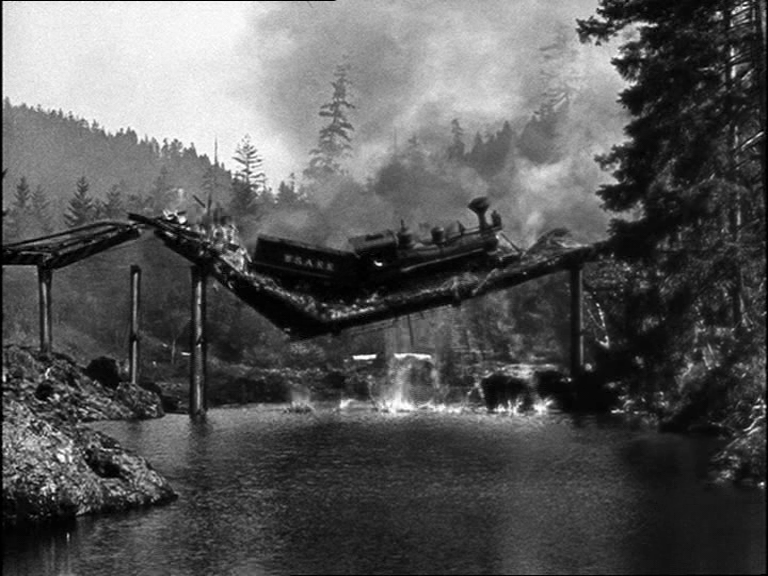 Some of the best, most out-there stunts are pure throwaways - such as when Buster has to run after a train and jump on it from behind. He makes it look like a child could do it. Trust me, that is extremely difficult to do, the laws of physics are against you the whole way and your feet won't be where your brain tells you they ought to be when it comes to actually land on the moving train. Does it sound like I've tried something like that in real life? Yes indeedy. Don't try it unless you really know what you are doing. To be sure, the film is not perfect, no film is. 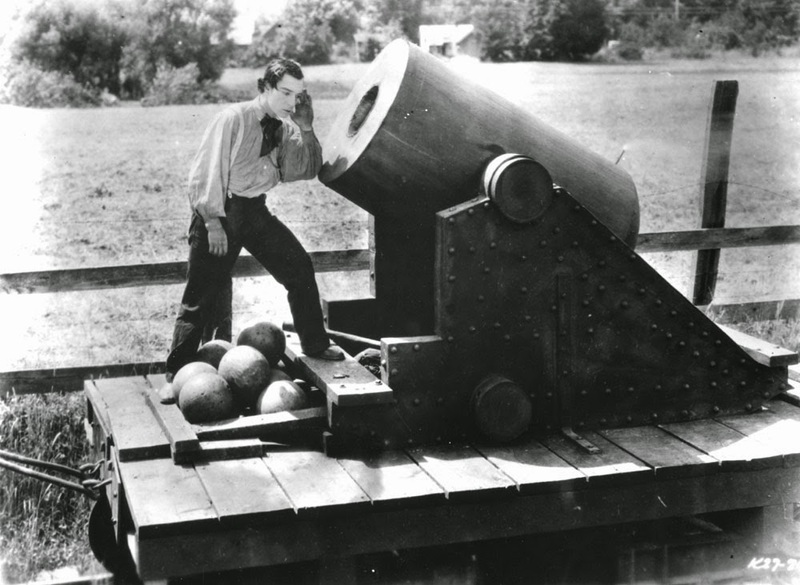 There is too much denouement, with some silly and really stupid slapstick involving cannons toward the end. That's the problem with a film that essentially is a sequence of connected vignettes - the quality varies, and when a scene doesn't work (there are a few), it really slows the film down and makes you realize how much time is passing (it's a fairly long film). Buster speaks to us, across the years, with his perfect facial expressions, telling us that he gets it, he wants you to know that he gets it just like you do - but in 1926. He does a quadruple take for the ages. Marion Mack as Buster's girlfriend gets her own identity for her fussiness in the train that shows both how frustrating women can be to men - and why they love women so much. You must delve below your intellectual preoccupation with gender politics to appreciate this, just try to understand the situation. Human frustration, turning to passion - but it's all passion, yin and yang. We are human, and what makes us human is passion, on all sides of that word. I could go on and on, and probably will some day. That's all for now. I do not agree with those who claim that "The General" is not funny enough - it's not supposed to be a laugh riot. 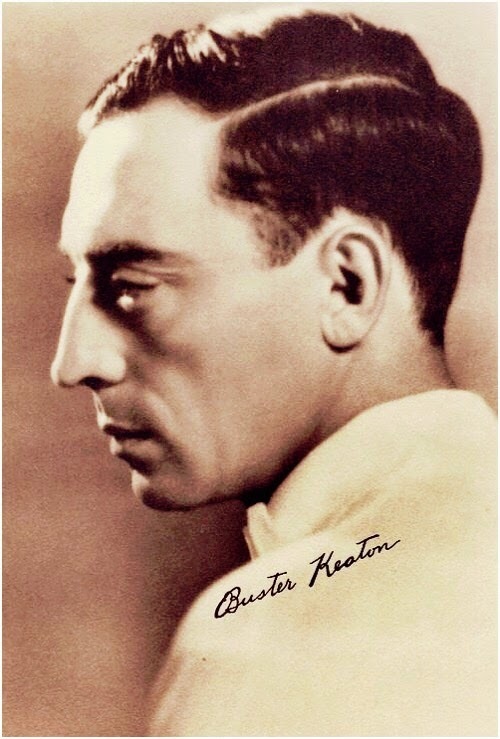 There is obvious sarcasm throughout, Keaton displays a very modern sensibility in that sense ("They spent a very restful, refreshing night" - in the woods, in the rain, Buster having to physically wrench his legs back into shape afterward). If you do get a chance to watch this, try and find a version with modern music that fits the theme - it will make all the difference. Best silent film ever made. Below is a copy of "The General" - it is out of copyright.